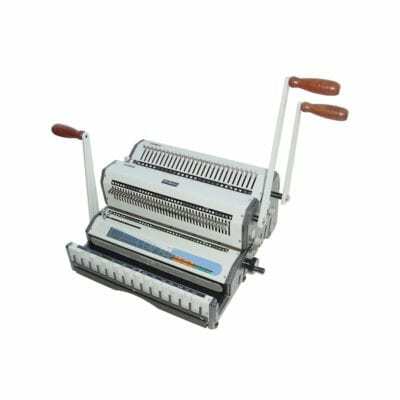 Key FeaturesSingle punching capacity: up to 20 sheets (20lbs paper/ letter size) Depth Margin Control: Provides the correct punch margin depth for each wire/comb size. Maximizes document tear resistance. Open Punching Throat & Continuous Punching Guide: For an easy alignment & punching of longer documents. Built-In Wire Closer: Closes any wire from 3/16” to 1-1/4”; integrated into all configurations. Wire Closer Control: With continuous adjusting scale for an exact and secure closure every time. Master Selector: Determines the correct: Wire Diameter, Closing Position, Depth Margin & Wire Pitch. Diameter Scale: Measures document’s thickness in order to select best wire/comb size option. Wire Holder: Holds wire in place for easier inserting of sheets Side Margin Control: Provides and evenly Centered punch for all document sizes. Die Disengagement Pins: All dies can be independently disengaged, allows punching of any size document while preventing partial side-end perforation. Heavy-Duty Design: The latest in CAE (Computer-Aided Engineering) technology Single punching length: 14” (13” for coil) - with open ends for longer sizes.